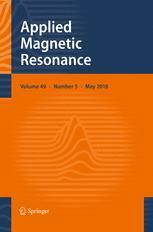 We demonstrate the spin interactions between dispersedly trapped electrons and holes in a semiconductor using the double electron–electron resonance (DEER) method of the pulsed electron paramagnetic resonance (EPR) techniques. An aluminum-doped titanium dioxide crystal is adopted as a spin system, in which optically generated electrons and holes are trapped, to reveal EPR signals that appear close to each other at a selected crystal orientation under an external magnetic field. We used the four-pulse DEER method by applying two microwave frequencies to a microwave cavity for pumping electrons and probing holes at the optimum temperature of 32 K. The dipolar modulation in the probed signal by pumping interacting spins was successfully detected. The observed non-oscillating decay shape indicates that the detected interaction is caused by widely distributed trapped electron and hole spins over long distances. We were able to extract a spin-pair distribution function by the first derivative of a background-corrected curve, referring to a previously reported method.